During the course of a lifetime, a person will encounter an endless number of individuals, but only a very few will have a deep impact on one’s view of the world. So it was for me when I met Ralph Leach. For more than 25 years, Ralph was a mentor, wise counselor, and friend. I owe a great deal to him, especially, perhaps, for his leadership in appointing a 36-year-old bassoonist to the revered post of president of The Juilliard School in 1984. 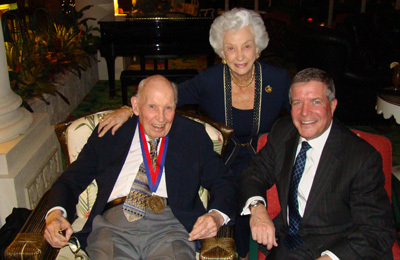 Ralph Leach, left, and his wife, Harriet, when he received the Juilliard President’s Medal from President Joseph W. Polisi, in December 2009. Mr. Leach was vice-chair of the School’s board in the 1970s and ’80s. Ralph passed away on October 3 at the age of 93, surrounded by his family. He had lived for many years in an extended care facility in Fort Lauderdale, Fla., with his beloved wife of 66 years, Harriet. I had the chance to visit Ralph and Harriet periodically, and I was always amazed by Ralph’s ability to grasp the many intricacies of world events and to present analyses and proposed solutions that were realistic, yet visionary. Ralph was one of the most successful financial leaders of his day, eventually serving as chairman of the executive committee of J.P. Morgan and Company. Although I experienced Ralph’s professionalism and expertise as a financier during his years as vice chairman of Juilliard’s board, I was equally impressed with his deep understanding and love of music and his great affinity for the art of dance, made that much more alive by the career of his daughter, Barbara, a professional dancer in the Netherlands. Ralph understood the power of the arts in our society, and he spent much of his time in retirement supporting arts groups in his adopted Florida community. I, along with my friends and members of his family, will deeply miss Ralph. He was a person of dignity, grace, wit, modesty, and intellect, and I am a better person for having had the privilege of calling him my friend.